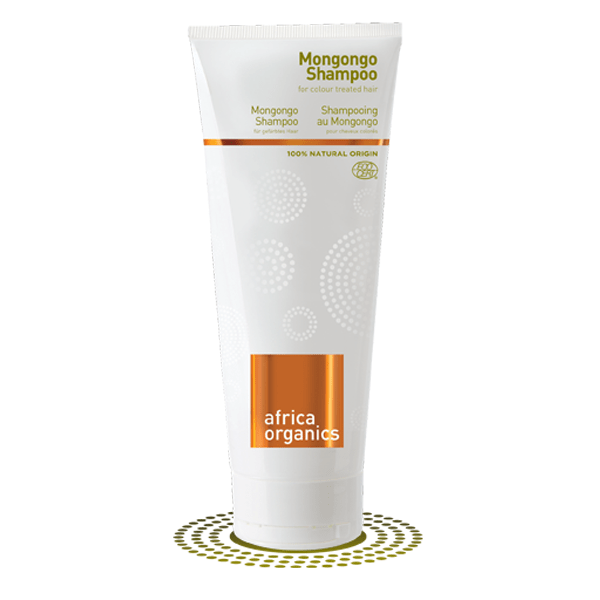 Mongongo Shampoo (210 ml) by Africa Organics. Mongongo trees grow particularly well in the deep sands of the Kalahari Desert and can survive droughts that span years. We use oil pressed from the seeds because it contains eleostearic acid that polymerises rapidly under UV light to form a protective film over each hair. This Natural and Organic product is certified by Ecocert Greenlife according to Ecocert standard. Africa Organics was formulated with ecology and organic sensibilities in mind. Guided by the Ecocert and COSMOS standards, each product has been crafted with the aim of securing 100% Organic certification. These products are biodegradable and suitable for sensitive skin. Africa Organics also strives to be community conscious at all times- they work closely with PhytoTrade Africa, who monitor the sustainability of the wild-harvest and they make sure that the harvesters are paid fairly and quickly. So you know that every time you buy one of these products, someone in rural Africa benefits. This range was launched to take the amazing plants of Africa to the rest of the world. You can access almost a quarter of the world’s plant species in South Africa alone and these plants produce some of the most powerful ingredients known. Africa Organics aims to bring you a 100% natural, certified organic hair and body care range that uses Africa’s most powerful plant ingredients, while at the same time contributing to the well-being of Africa’s rural communities and its plant biodiversity.